Throughout this conference, almost without exception, the archaeologists, scientists, epigraphers and textual scholars could find no compelling evidence that would support the claim that the Talpiot Tomb under discussion (one of many tombs in the Talpiot district of Jerusalem) was anything other than a first-century Jewish family tomb with no connection to any known historical family. There were a few scholars on hand, working in the literature and the social sciences, who would contend that there was some likelihood that the tomb was actually the tomb of Jesus of Nazareth and his family. 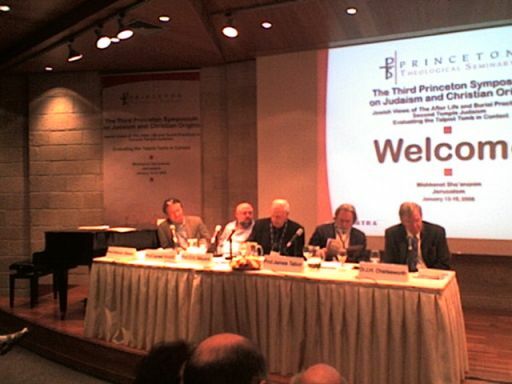 The final panel comprised Shimon Gibson, one of the original excavators of the tomb; Eric Meyers, Professor of Archaeology at Duke University; Chairperson James Charlesworth of Princeton Theological Seminary; Israel Knohl, Professor of Jewish History and Literature at the Hebrew University; and James Tabor of the University of North Carolina at Charlotte. In his concluding statement, Shimon Gibson said no to the identification of the tomb as belonging to Jesus of Nazareth (preferring the traditional location at the Church of the Holy Sepulcher). Eric Meyers said that there was no compelling evidence to support the film’s identification with the tomb of Jesus and his family. James Charlesworth said he did not believe it was the tomb of Jesus but that he would not rule out the possiblility that it might be the tomb of other members of Jesus’ family. Israel Knohl stated publicly that although there is no compelling evidence to support it, it well could be the family tomb of Jesus. However, privately he stated that he feels there is only a 50-50 chance of it being so. James Tabor, as expected, feels that the likelihood is high to certain that it is the family tomb of Jesus. To my ears, most of those in attendance, in good academic form, would not totally rule out the possiblilty that this is the tomb of Jesus, but would say that the possibility is highly unlikely to remote. This is far from being “50 of the top scholars in the world” now concluding that “the Talpiot tomb might very possibly be the tomb of the Holy Family.” I would say that the participating scholars, equipped with improved methodologies and more knowledge than a year ago, would say that they are better equipped to judge, and that the tomb’s chances haven’t gotten any better (in fact, worse). In the meantime, this is the handout from my talk at the conference on the Yeshua? bar Yehosef ossuary. Better supportive pictures are available on earlier postings of this blog.